“Number is the ruler of form and ideas, and the cause of gods and daemons.” – Pythagoras, as quoted in Life of Pythagoras (c. 300) by Iamblichus of Chalcis, translated by Thomas Taylor (1818). – Quote source + Image source. According to the most popular type of numerology used in the U.S. today, I am a Life Path2, an Expression 7, a Personality 4 and a Hearts Desire 5. But what do these different numbers mean? And what is the basis for assuming that they have any meaning at all? Historians have identified numerological practices among different cultures across the globe and throughout history. The earliest evidence comes from Ancient Babylonia, and it is seen again in 5th century BC Greece and Hellenistic Alexandria. It appears in Hebrew religious texts and Jewish Kabbala, as well as among the early Christians and in the occultism of the early Gnostics. The Indian Vedas, Chinese ‘Circle of the Dead’ and Egyptian ‘Book of the Master of the Secret House’ also strongly suggest numerological practice within these cultures. To better understand the foundations of modern western numerology, it is useful to understand the history of the different forms of numerology. Babylonian numerology is also known as Chaldean numerology as it was developed by the Chaldeans, who occupied the southern part of Babylonia from the 10thto the mid-6th centuries BC. The Chaldean approach to numerology is said to have been chronicled in their Chaldean Book of Numbers, which is not extant, but referenced by authors. It seems that like in more familiar modern numerology, each letter of the Akkadian alphabet (used by the Chaldeans) was assigned a numeric value. It differs from the approach that we are familiar with today in that letters were only assigned numbers from 1 to 8 (rather than1 to 9), and rather than the assignment being based on their position in the alphabet, letters were assigned numbers based on their natural vibration. Little is known about how the Chaldeans used numerology and for what purpose, but astronomy also played an important role in their religion and it is very likely that the two practices were linked. In Ancient Babylon astrology was used to interpret messages about the desires of the gods and the state of the world. For example, the position of the celestial bodies could indicate a storm or war if a god was unhappy, or a period of prosperity if the gods were pleased. Interpretation was primarily based on knowing what had happened when the stars and planets were previously in the same positions; the Babylonians believed that the planets inhabiting the same positions indicated a return of similar events. The Babylonians also believed that disasters indicated by the stars could be avoided by conducting certain rituals to appease the gods, or by causing the prophesised event to happen to a substitute, such as an effigy of the king. Numerology was also likely used to find correlations between people and concepts, and things that had come or happened before that shared the same numbers. Greek numerology is often called Pythagorean numerology, as the philosopher mathematician was the most famous proponent of the art. Born in Greece shortly after 600 BC, Pythagoras was famous even in his own time, and thus when he was around 50 years old and established his own school in Crotona, Italy, many flocked to study with him. Rather than being a place of study as we know it today, it was more like a secret society, and participants (both men and women) had to adhere to a strict code of secrecy and were not allowed to put any of his teachings into writing (luckily many wrote down his teachings after his death). It is also reported that students had to pass 5 years in complete silence at the start of their training in order to gain the required level of deep contemplation. Rather than focussing on solving mathematical problems, as is the case with modern-day mathematicians, Pythagoras was primarily interested in the principles behind numbers. He felt that the entire universe could be expressed through numbers, and thus numerology appealed to his philosophical sensibilities. To that end, he embraced numerology and expanded the system based on his philosophical principles, but it is unclear how much Greek numerology had already evolved from Chaldean numerology at that time. Like the Chaldeans, it is unclear what purpose numerology served for Pythagoras and his followers. They certainly believed that numbers had characteristic properties, for example, 2 was male, 3 female, 5 associated with marriage, and 10 with the divine. 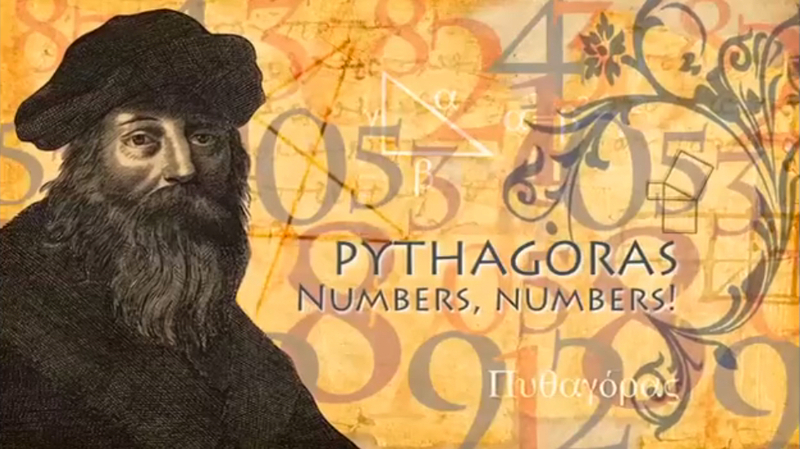 Read more on Pythagoreans number here. The Greeks may have believed that people had numbers, as a piece of Greek graffiti found in the Roman town of Pompeii, that was destroyed by a volcano in AD 79, reads ‘I love the women whose number is 545’. At around the same time as Pythagoras was teaching numerology to his students, Jewish numerology, also known as Gematria, was being practiced. There was probably a lot of cross-influence between Greek and Jewish approaches. While the term Gematria is Hebrew, it probably derives from the Greek term geometria (meaning geometry), or the Greek term grammateia (meaning grammar). Gematria also assigns numerical values to words or phrases, and then relates words and phrases (in Hebrew and a lesser extent Aramaic) with the same numbers to one another, and also relate them to other things that have that numbers, such as a person’s age or a calendar year. Examples of Gematria survive that assign values to individual words, entire biblical verses and Talmudic aphorisms, phrases from Jewish prayers, personal and divine names, and other religiously significant materials. Gematria assigns the 22 letters of the Jewish alphabet numbers ranging from 1 to 900, and how the value of words are calculated differs greatly from other numerological practices. One of the best-known examples of Gematria is the Hebrew word Chai (meaning alive) which is composed of two letters in Hebrew script, which give the word the value 18. This association has made 18 a lucky number for many Jews, and gifts in multiples of 18 are very popular (why send just 12 roses…). Traditionally Gematria was used to interpret biblical texts, relating text to one another and identifying underlying meanings. It was also often used to decipher the various names of God and their associations. The numbers derived are also often used to relate people and concepts to different parts of the Sephirot (Kabbalah tree). Despite this long history, the earliest known reference to numerology in English dates only to the early 20th century. The rise in popularity of numerology at this time can largely be attributed to Mrs L. Dow Baillett. A biblical and philosophical scholar, she published a book called The Philosophy of Numbers in 1908 in which she coined the term vibration to describe the characteristics of different numbers. Her student Juno Jordan created the California Institute of Numerical Research to continue Baillett’s research into numerology. The Romance in your Name, published in 1965, is the culmination of the work conducted by the Institute, testing the meaning of different derived numbers against evidence for what is happening in the universe. This is similar to how astrology is tested, making predictions of high-profile individuals, measuring the accuracy of those predictions. It is this book that talks about identifying the key numerological influences in a person’s life based on their name and date of birth, forming the basis of the modern system. Modern western numerology is said to be based on Pythagorean numerology. The method for calculating the value of words is based on the Pythagorean system. The idea that the world is constructed according to a mathematical plan that can be decoded is also a Pythagorean philosophy. However, the numbers that have been defined as the most important in a person’s life, and what they relate to, area modern invention. The Life Path number is determined from your full birth date and is said to encompass your entire being, much like your natal chart in astrology. It is said to be a blue print for how your life will play out. The Expression number is based on the letters of your full name at birth and refers to your innate talents and abilities. It is thought to reveal information about strengths and weaknesses that will help and hinder a person throughout life. The Personality number is derived from the consonants in your name at birth and is supposed reveals how other people see you and the image you project into the world. The Heart’s Desire Number is derived from just the vowels in your name at birth and is thought to speak to the inner workings of your mind and your personal desires. Myriad other numbers have been developed to learn more about a person such as their ancestral traits number, hidden passion number, bridge number and life lessons number. You can read more on modern numerology at websites such as www.numerologysign.com. There is a great deal of literature available recording the meaning of the different numbers, and how they should be interpreted depending on where they appear in a person’s numerological chart.